Auster Rubber Co. Inc. has the in-house capability to fabricate cellular rubber and plastic to any specification. For over 30 years we have supplied industry with quality foam products. Our experience enables us to anticipate and fulfill your needs. In our vast 75,000 square foot facility, we use state of the art equipment and the latest processing techniques. Our expert sales staff finds solutions to all your application needs. Your order is designed, efficiently produced, and promptly delivered. No headaches, no hassles: just good, old fashioned, friendly service. 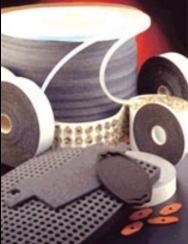 At Auster Rubber we manufacturer weather stripping & gasketing, with or without pressure sensitive adhesives, out of both open and closed cell foams & rubber.